UO professor Joanna Goode has spent the last 10 years helping make high school computer science courses more accessible for girls and underrepresented students, and succeeding across much of the nation. “Oregon in the computer science education arena is near the bottom in terms of having any policies, any courses offered at schools, any teacher support,” she said. But that’s finally changing, thanks in part to Goode, an education studies professor who since 2008 has been at the forefront in helping improve access and equity for underrepresented students of color and females in computer science education. As a co-leader of a three-university consortium, she helped develop a new program tailored for Oregon high schools. The program, CS for Oregon, builds on Goode’s earlier research that was a basis for Exploring Computer Science, a curriculum and professional development model. That in turn served as a roadmap for the concept behind Computer Science for All, a popular program that has spread to high schools across the country. It just never caught on here. But CS for Oregon — a joint project between the UO, Portland State University and Oregon State University, Cascades — is giving Oregon high schools the opportunity to engage their students in an inclusive, equitable, evidence-based computer science curriculum. 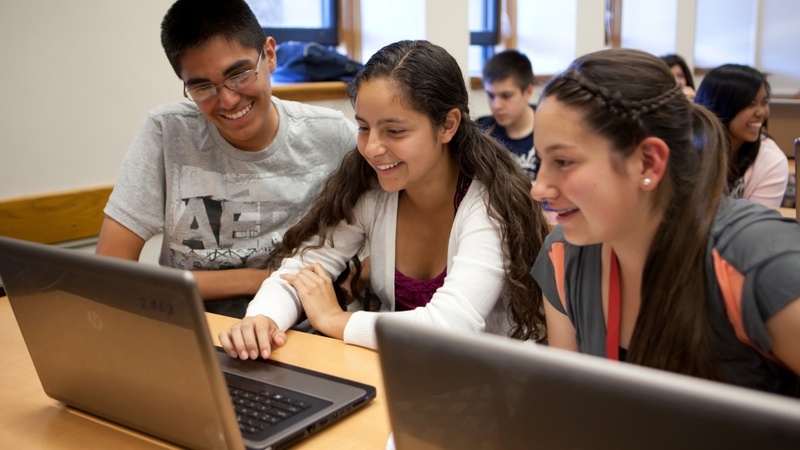 Co-developed by Goode, the program, funded by a $1 million National Science Foundation grant award, includes the Exploring Computer Science course curriculum and provides participating high school-level teachers with free professional development training. Anymore, few school subjects are not touched by computer science, whether it’s writing for blogs, websites and texting; using math, geography and history to design algorithms and code applications; or sharing information and artwork through computer-aided graphic design. The work being done by Goode and her colleagues helps ensure that classes teaching those important skills are available to all students. CSPDWeek, a professional development summer retreat in Bend, brings together teachers — both seasoned and first-year — to discuss what works, what doesn’t and how to add introductory-level computer science courses to their curriculums. At the 2018 session, CS for Oregon trained its first group of 22 high school teachers from 16 Oregon school districts, with plans to double the number in 2019. Although the program is designed for all Oregon schools, Goode is quick to point out that CS for Oregon is not just another enrichment program. She said it’s an equity program that hopes to attract traditionally underrepresented groups such as minorities, students of color and girls, as well as students from rural and low-income families. Most computer science classes tend to focus on learning how to use programs and tools, she said. But Exploring Computer Science focuses on conceptual ideas of computing that help students understand problem-solving processes through real-world application of computer science and why certain tools or languages solve particular problems. Some of the hands-on activities taken directly from the curriculum include virtual basket weaving, an activity in which students place colored circles in columns and rows to simulate the same grid pattern produced by a traditional basket weaving loom; designing a program that tells a computer how to make a peanut butter and jelly sandwich or map a bus route; creating their own adventure animation; or doing activities centered around robotics.